Family & Cosmetic Gentle Dentistry, LTD. performs various Dental Cosmetic Procedures. Click on the procedures listed below to see before and after images and to read more information about each one. A mouth full of dark colored metal is so common, that many people don’t know there is an alternative. For many years amalgam (silver/mercury) was the standard filling material used in dental practices, and we continue to use it in some cases. However, while it is still a safe and functional restoration method, amalgams just don’t look as good as tooth colored fillings. 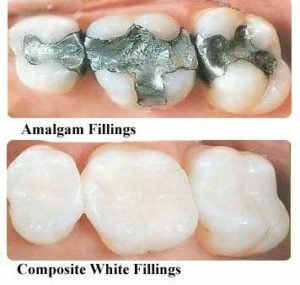 We like composite/resin fillings for their natural appearance and the near perfect color match we can get with your teeth. Teeth with large metal fillings in them can develop cracks over time. Left untreated, these cracks will eventually cause further damage to the tooth. For this reason, replacing metal fillings with natural looking tooth material can dramatically decrease the chances of problems. Composite fillings can bond better to your teeth, helping to restore your tooth’s natural strength. Not to mention, that smile just looks better and more natural without all that metal! Our recommendation is when the old silver filling needs to be replaced, it’s a good time to replace all restorations in that arch. The difference between an arch with silver fillings and an arch with white bonded filling replacements is remarkable! Your smile will immediately brighten up with the gray silver fillings being removed. Dental implants are so natural-looking and feeling, you may forget you ever lost a tooth. You know that your confidence about your teeth affects how you feel about yourself, both personally and professionally. Perhaps you hide your smile because of spaces from missing teeth. Maybe your dentures don’t feel secure. Perhaps you have difficulty chewing. If you are missing one or more teeth and would like to smile, speak and eat again with comfort and confidence, there is good news! Dental implants are teeth that can look and feel just like your own! Under proper conditions, implants can last a lifetime. Check out our Dental Implant FAQ for more info! 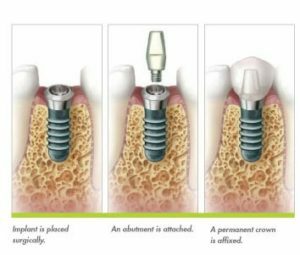 Crown and Bridge treatment is a long-term method of replacing missing teeth. A Crown is placed over an individual tooth where there is no longer sufficient tooth structure left to place a filling. A Bridge spans space where one or more teeth have been lost in the dental arch. The teeth on either end of the span are crowned, and are referred to as abutments. The false teeth in a bridge that join the abutments are referred to as poetics. Crown and Bridges are most often made from superior materials such as precious metals (gold) semi-precious metals, porcelain, or a combination of metal fused to porcelain. Both aesthetics and function are considered when selecting the material most suitable for your case. Our at-home whitening provides you with dazzling results…only 30 minutes of wearing trays a day. Whitening is fast, easy, convenient, affordable, and long-lasting. Many people suffer with pain from wisdom teeth. In most cases, pain is the first sign something is wrong. Yet, the fear of pain often prevents people from seeking the help they need in oral care. Surgical dental problems require specialized care like sedation. Dr. Bodin has the specialized equipment, facility and staff to properly address todays most demanding oral surgery needs. Our goal is to provide you with the highest level of treatment available. Contrary to public opinion, healthy gums don’t bleed!! Bleeding gums are a sign of inflammation and many times the first warning sign of periodontal disease (also known as ‘pyorrhea’). It’s very important to take care of your bleeding gums before they get worse and cause advanced periodontal disease, which is the leading cause of tooth loss among adults worldwide. Questions about your oral health, nutrition, and/or implants? Dr. Schwartz and Dr. Alb have schedule availability at our Wayzata, Spring Park, Shakopee and New Hope locations during the week to answer your questions. Avoid the high cost of travel and take advantage of our many years of experience and wealth of knowledge in these areas. Get the prompt and reliable answers that your questions deserve. To schedule a 30 minute complimentary consultation, call the location that best suits your needs. Our staff can help you find a way to have the beautiful smile you have always wanted and deserve.